While communism is a world of light. It’s a rather apt choice of name. With much of North Korean society shrouded in secrecy, it takes an insider to focus the light on what really happens there. Class 149! I cringed to hear it spoken out loud. Those words were enough to strike terror into any listener. Even the seal used to stamp the document seemed not some innocuous wax stick but an iron brand, heated in flames and seared indelibly onto the rumps of livestock. It had been used to brand slaves too, in the old days; now Min-hyuk’s father and uncle, even young Min-hyuk himself, bore its mark. Not merely on the skin, but biting deep into the flesh. Once the writer realises that even his nephew is tarred by association, he decides that the family’s only choice is to leave the country, or perish in the attempt. The final story, ‘The Red Mushroom’, revolves around a similar concept. A journalist becomes involved in the story of an agriculturalist attempting to reclaim land in the mountains for the community and is appalled when the man is hung out to dry when nature turns against him. The man, a former scientist, was in exile from the capital after the discovery of a relative’s flight to the south, and this final attempt to regain the state’s favour literally crumbles into dust. The title is apt, comparing the poisonous mushrooms growing in the mountains with the red-brick government office the main character sees for the first time at the end of the story (and, tellingly, with communism itself…). Other stories focus on daily life in North Korea and the difficulties this entails for the average citizen. In ‘City of Specters’, the writer describes the intense preparations for the National Day celebrations and parade, with one woman finding out the hard way that there are no excuses for a lack of enthusiasm, no matter what your background. ‘Pandemonium’, meanwhile, focuses on an elderly couple and a grandchild caught up in the turmoil of transport cancellations (owing to a high-level visit). The result is a series of accidents and injuries, yet the old woman sees a very different side of life when she hitches a lift with a very familiar face. This idea of ordinary lives frustrated by bureaucratic obstacles is especially prominent in ‘So Near, Yet So Far’. A man returns home after weeks of absence, telling his wife of his desperate (and foolish) attempt to reach his mother before her death. Having failed to obtain a pass to travel to the region, he ends up taking a dangerous (and eventually futile) trip that ends with severe consequences. The beating is bad enough, but you sense that his real problems are only just beginning. The stories all date from the nineties, a time of particular hardship in North Korea, and their descriptions of denunciations and betrayal are guaranteed to fascinate the western reader. The Accusation certainly reads well, with Smith producing an excellent text in English, with just the right mix of natural English and hints of Korean structures and style. The stories show the writer’s liking for frame narratives, and in each case the ideas are cleverly integrated by the end of the story. If I were to play devil’s advocate, though, I’d say that the collection can be a little too melodramatic at times, with the idea of the good people thwarted by the system wearing a little thin. 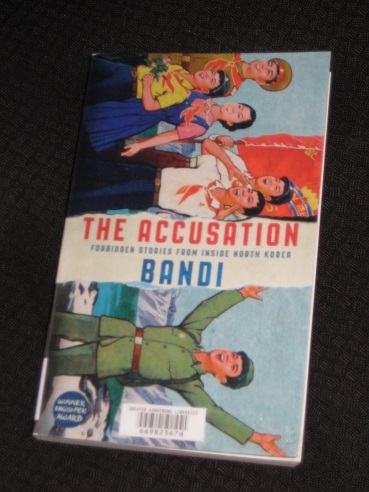 Ironically, there are hints of a communist style here, with liberal exaggeration (especially the sudden death from heartbreak of those exiled from Pyongyang), and a sense that Bandi is using the North’s own literary style and culture to critique it. In addition, for anyone with a fair grounding in Korean literature (or a passing knowledge of world affairs), there’s nothing earth-shatteringly surprising here, merely confirmation of what we already knew or suspected. I found the collection fascinating, though I know what you mean about it being a little heavy-handed; every time you spotted a symbol, the writer was sure to tell you about it a page or two later! There’s also nothing earth-shatteringly surprising for anyone who has read any literature set in a dictatorship, to be honest. Grant – Yes, I enjoyed it, but there’s nothing really new about the content, other than the fact that it comes from down Pyongyang way. At the time, I did think this might have got a Booker longlisting as it seemed like the kind of book they’d be falling over themselves to consider, but having read it, there just isn’t that something special that would justify the decision.